Phase Separation in Gasoline?s containing Ethanol is now a major problem for nearly all users of gasoline. We recently worked with a major fleet where a fairly large number of vehicles were fueled from a single tank and about one-half the vehicles were stored inside and the other half were stored outside. After a night with a 30?F+ temperature drop, several of the vehicles stored outside developed problems with significant amounts of water found in the vehicle tanks. After checking the storage tank and finding no measurable water, they looked for other possible causes including sabotage. After looking at many possible causes Energy Technology Group was consulted and we were able to describe the Phase Separation through temperature change scenario and determine that this was the most likely cause of the problems. Gasoline containing Ethanol provides further challenges and dangers for marine operators (Boaters) and other users of seasonal equipment such as motorcycles, personal water-craft, snowmobiles, ATV?s, RV?s, yard maintenance, generators, and other equipment. Ethanol has less energy (as measure in Btu?s ? British Thermal Units) per gallon than does regular unleaded gasoline. 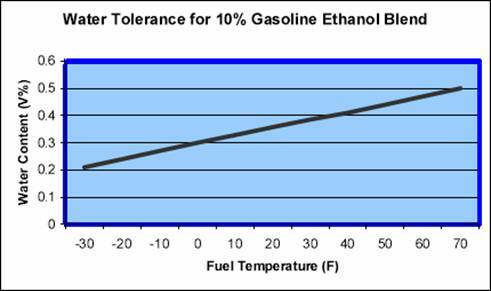 This means that the more Ethanol found in fuel the worse your fuel economy will be. You use more gallons of fuel containing Ethanol to go fewer miles. Energy Technology Group, Inc.?s Optimax? Gasoline Treatment contains a proprietary mix the latest technologies that will eliminate large amounts of water, prevent the formation of gums, varnishes, and carbon deposits and will actually safely and quickly clean existing gums, varnishes and carbon deposits aka. Combustion Chamber Deposits. Optimax? used on a regular basis (every tank), will prevent or ameliorate new damage to tanks and fuel system components in all types of vehicle and equipment. Optimax? will significantly improve fuel economy and drivability in all gasoline engines using Conventional and Reformulated Gasoline?s with or without Ethanol. Optimax? provides a high tech fuel stabilizer to prevent fuel deterioration when fuel or vehicles, boats, motorcycles, and other types of equipment are stored for extended periods of time. Because of all the problems with Ethanol Blended gasoline?s we will list some specific suggestions and recommendations on how to deal with and resolve many of these problems. In bulk storage tanks where you believe phase separation may have occurred or where you are concerned it may happen. We suggest the use of a modified water finding paste such is made by the Kolor Kut Company. This paste starts out brown, if you dip the tank with a measuring stick with the paste and it turns yellow (even light or spotty yellow), you have significant water dissolved in the fuel, if the paste turns red you have free water. If you have fuel that has not yet separated we recommend adding EcoFuel at one gallon per one thousand gallons of tank capacity (minimum of one gallon) in the tank. This will cause a dispersion reaction to take place which will pull an equal amount of water out of the fuel. You should then start a regular program of treating with Optimax? at one gallon per fifteen hundred gallons of fuel. If you have fuel that has Phase Separated and you have either two or three layers you should arrange to have the tank pumped from the bottom to remove the one or two bottom layers containing the water and or the Ethanol/Water mix. (Note: you should check again with the paste before the technician leaves to be certain that all the Water and Water/Ethanol has been completely removed). You do not need to remove the gasoline. Treat with EcoFuel? at one gallon per one thousand gallons of tank capacity (one gallon minimum). Check with water finding paste after 24 hours. If no red or yellow present then add clean fuel to the tank to working capacity and then treat with Optimax? at one gallon per fifteen hundred gallons of fuel.